My New & Improved Websites! After a couple of months of struggling & attempting to drive myself crazy, my new websites are now live!! I’m going to guess there are still some bugs in there because I never seem to make a website without a bug or two once it goes live, but I’m working on fixing any & all bugs as soon as I’m aware of them. Please bear with me! Do You Appreciate & Respect Nature? I have friends who follow the Pagan religion. Naturally, they follow Pagan pages on Facebook. Often they share things that inspire them or that they like. It’s not often “join our religion, it’s awesome! !” type posts. In fact, that is rare. 99% of the time what they share are stunning nature themed pictures. A white owl, baby foxes playing, a pretty path in the woods, a wildflower meadow, a starry night… beautiful scenes. It just crossed my mind that the Christian pages I follow don’t share such images. They share lovely & inspiring things, of course, but I haven’t seen anything like what the Pagan pages share- simple beauty in nature. Why don’t more Christians do that same thing? I mean, we obviously believe God created everything- why don’t more Christians take the time to appreciate what God has created? Why aren’t more Christians concerned with animal abuse? And, why do so many object to herbal remedies when they are often much safer & more effective than pharmaceuticals? It’s sad to me how few Christians think that way. I actually unfollowed one Christian page on Facebook some time ago because so many said terrible things about animals- how stupid they are, we don’t need them, “the only way I like animals is barbecued” & other awful things. And, those who professed to love animals were mocked & shamed. Personally I don’t see anything at all wrong with appreciating & respecting nature. I love staring at the sky on a clear, starry night. A full moon is also one of my favorite sights, as is the colors of changing leaves in the fall. I also love the sounds of a thunder storm or quiet beauty of a blizzard. Obviously, I love animals- I brag about mine plenty! lol I also use valerian root capsules & lemon balm for anxiety & St. John’s Wort capsules for depression rather than prescription medications, & have mentioned that in several of my books. Doing such things hasn’t compromised my faith in God one bit. In fact, it makes me feel closer to God when I stare in awe at the moon & stars. Taking in the beauty of nature helps keep me grounded, calms my anxiety & makes me very grateful for the wonders around me. Being close to my furkids makes me grateful that He has seen fit to bless me with these adorable critters. They bring me an incredible amount of joy. I’m also grateful for the natural remedies to help my mental health, especially knowing I don’t run the risk of awful side effects so many prescription anti-anxiety & anti-depression meds have. Dear Reader, I hope if you haven’t considered these things before, you will now. God made the Earth & everything in it (Psalm 24:1). What could possibly be wrong with using & appreciating the beautiful, useful things He has made, even thanking Him for them? Although I usually write about narcissism & its traumatic effect on others, today I want to take a break from that topic. Since many of my fans love animals as much as me, I’m sure you won’t object. I became livid last night while watching this show, because although the cat parents tried, their vets failed them miserably! A couple had a 14 year old cat who would fling himself around in his sleep! They were afraid, & rightly so that he could hurt himself! Their vets said he was fine. Yet, a feline sleep specialist immediately realized kitty had a stroke, & his brain was damaged in the area that affected his sleep. At this point, kitty was shown walking away, & I recognized that wobbly walk as my own kitty Jasmine had the same walk after her first stroke! How did vets not recognize that distinctive walk?? How didn’t they recognize his eyes acting oddly either? It broke my heart! For some reason many vets don’t recognize or properly treat strokes in cats! My Jasmine had 4 strokes before she passed away. After her first, the vet told me to ” just put her down. It was the only humane thing to do.”. I knew he was wrong in spite of his fervor, so I walked away from him. My girl lived 2 more happy years with only a sway to her back legs a clue to her strokes. Thank God for His wisdom! He showed me how to treat Jas at home, & introduced me to a good friend who is an amazing vet technician. Lethargy. Loss of interest in things once enjoyed, like special toys or foods. Eye issues. Jasmine’s eyes darted side to side. Some cats also experience uneven pupil dilation. Facial paralysis on one side. If your cat experiences these symptoms, get her to the vet immediately! If you feel her diagnosis is wrong, listen to your gut feeling!! I did & am forever grateful I had 2 more wonderful years with my Jasmine!! As far as treatment, many cats recover completely a few weeks from a stroke with no known cause. Others may have kidney disease, hypertension, hyperthyroidism or another cause for the stroke. Those cats need medication to properly treat those serious illnesses. No vet told me this but after Jasmine’s second stoke, I put her on one 81mg baby asprin twice a week (more can be toxic to cats) & massaged her often to keep blood flowing. I believe God showed me she needed this the day of her second stroke. She had trouble walking & her left rear leg was cold until I did these things. She recovered quickly from that stroke. Feline strokes are terrifying of course, but often they can be managed. Keep a close watch on your kitty if he has a stroke. Exercise wisdom. Talk to several vets if need be. Try not to panic, as hard as it can be! Pray & pray often! Remember that your baby needs you to care for him, & God entrusted you with his care. I’m sorry for vanishing.. it’s been a very painful few days for me, & I haven’t been up to writing in here or in the new book. On Wednesday, my mother’s birthday, we suddenly lost one of our beloved kitties, Georgie. I’m honestly not sure what happened. I am guessing his heart. He passed away quietly in his sleep. Here’s a picture of my sweet little guy..
Good afternoon! I have a very urgent prayer request for you today.. please pray in agreement with me that my friend’s cat, Magick, will come home soon, safe & sound. He was stolen 1 week ago. (Definitely stolen- he isn’t the running away type…he’s a homebody). Also, please pray God will give her wisdom when dealing with insensitive & cruel people. She has come across many in this past week who make snide comments like, “It’s just a cat.” “Get over it.” Maybe Magick is “just a cat” to them, but he is her heart. He is a very special boy, who my friend lovingly named after my cat, Magic, who passed on in 2007. Both are black shorthairs with very distinct personalities- highly intelligent, loving, devoted, caring & amazing fathers to the other animals in the house. 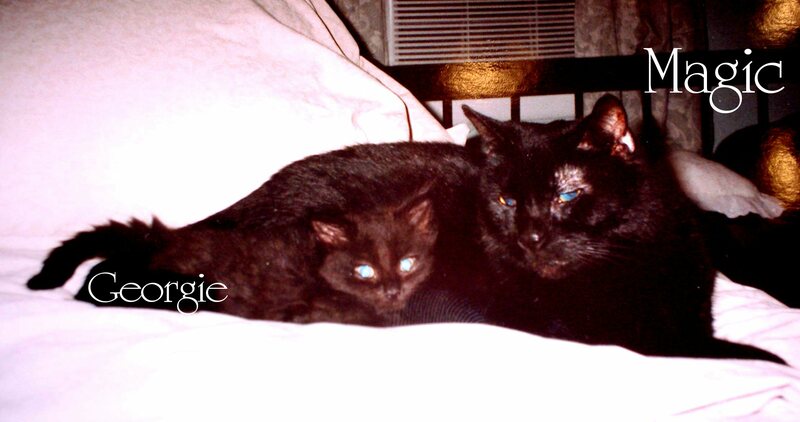 Although my Magic died & her Magick was stolen, I still feel her pain of losing such a special creature. It leaves a huge hole in the heart only a Magic can fill! I’m sure you fellow animal lovers will understand this completely.. Thank you for your prayers, Dear Readers!! I’d love to share a picture of Magick, (I always like to have a face to put with names yanno? ), but I didn’t ask my friend if she would mind if I shared his picture. So, instead, here is a picture of my Magic with Georgie in 2002. 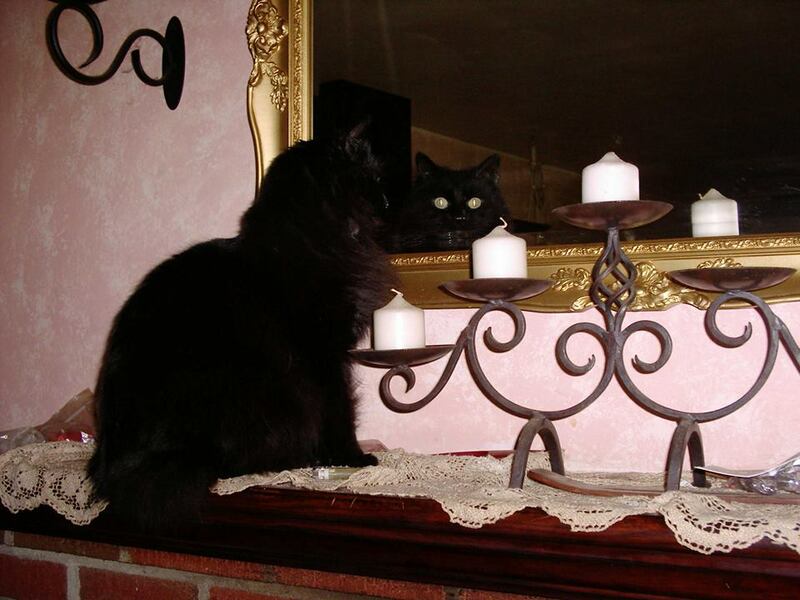 Both Magic & Magick look identical, so now you know what the kitty you’re praying for looks like..